​Johnny Depp's Sweeney ﻿﻿Todd called them his "faithful friends" in a striking scene from that Tim Burton classic. But macabre movie references aside, a well made straight razor is a man's true friend. 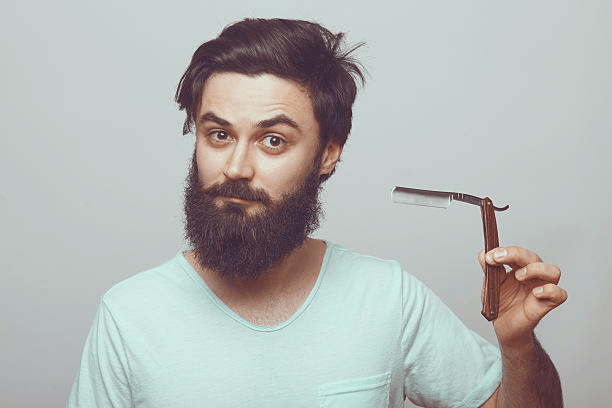 With proper maintenance, straight razors can last for several lifetimes. Anatomy Of a Straight Razor – Common Terms. 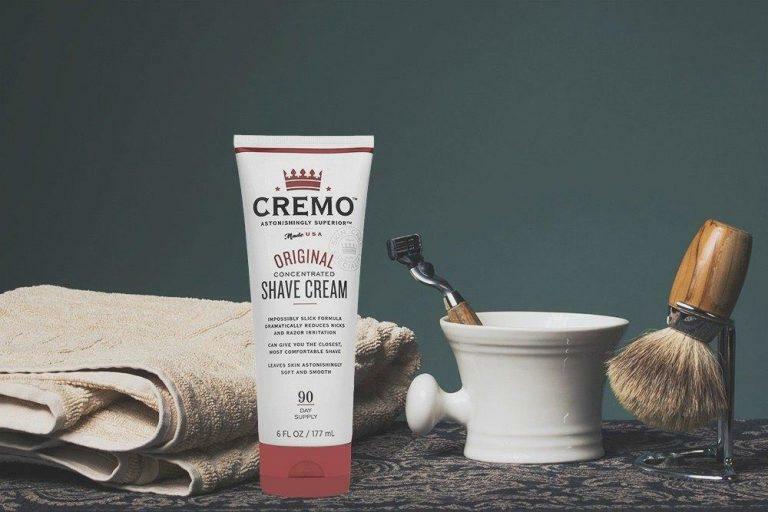 ​When it comes to getting the closest and smoothest shave, nothing beats a straight razor. If you are used to the finish you get with bulky safety razors, you will be straight up amazed by the difference. But a straight razor is not for everyone. They are very, very macho and masculine, but also quite intimidating at the same time. It takes a lot of time, patience and ﻿﻿practice to master the art of shaving with these razors. But the results are well worth the time and effort. ​When reading about straight razors, you might come across several specific terms that refer to parts of the razor. Here is a short compilation of the more prominent terms. Picture an open razor with the handle in your right hand, with the sharp end of the blade pointed downwards when reading the descriptions. ​Blade: the sharp cutting part of the razor, metallic, attached to a handle, into which it folds when closed. ​Point: this is the end of the blade, located at the extreme left of the straight razor when held open. ​Spine: the blunt back of the blade, opposite the cutting edge, and on the top. ​Tang: the completely blunt tail of the blade which is attached to the handle, often curved to serve as a grip for your fingers when you hold the razor. ​Jimps: notches found on the tang of some razors, for extra grip. ​Handle/Scale: it is the part which is used to hold the razor while in use, often made of wood. 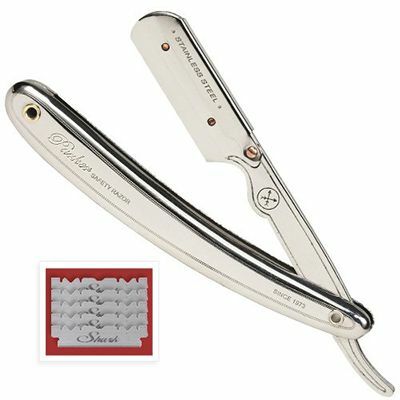 ​Marque: a stylized design, often painted or engraved on the handle of the razor. ​Gold Etching: a design or some text by the maker found on the blade. 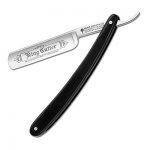 ​The blade is the most important part of a straight razor. The best quality blades are made from stainless steel, with other metals like silver, chromium, vanadium added for extra strength. ​Straight razor blades are often designated by fractions like 5/8 or 6/8. This is the width of the blade, described in terms of an eighth of an inch. For instance, if a blade has a width of 25.4 mm, it is designated as 8/8 (one inch = 25.4mm). A 5/8 would be a blade with 18mm thickness. ​​Blades can either be single or double grinds, depending on the method used to thin the metal down. This affects the profile of the blade but has no major impact on performance. ​​The two most common styles are round and square. They both have their advantages and safety risks. The sharp edges on a square point are useful for shaping mustaches, while a round point can work in really tight areas and angles. With the sharp protruding edges on a square point, it is easy to nick yourself. And it is the same with the round point since you are never quite sure where the cutting edge ends. Wood is the most common ﻿﻿material used to craft the scales. Ebony and Boxwood are quite popular due to their density and durability. Snakewood, Cedar, and Olive wood handles are also common. Wood scales do require extra maintenance like waxing and polishing to ensure their longevity. Metal handles are less common but more durable than wood. Stainless steel and aluminum are the materials used most often. You may find silver handles on expensive premium razors. Modern plastics are cheaper and durable options. Celluloid was often used in vintage razors, though it has been replaced by more advanced polymers like PVC and Bakelite. Animal products like horns and bones are often used in razor handles. The more premium ones will sport Mother-of-pearl, and turtle scales used to a popular choice until their hunting was banned. Ivory is also banned, though some manufacturers do offer high-end ivory handles made from mammoth fossils. 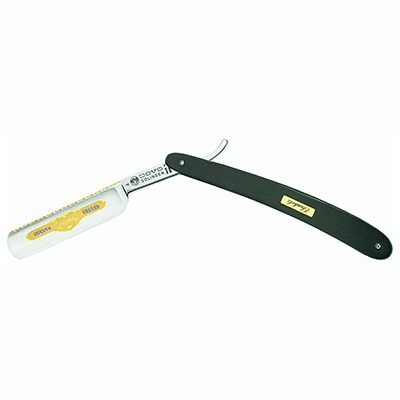 ​​This is an essential tool that is often provided along with a straight razor. A strop is a long strip of animal leather on which you run the blade of your razor repeatedly in a specific way. Frequent stropping is essential to maintain the sharpness of the blade and to reduce the chances of rusting. ​​Though not as essential as a strope, you will still need to run your blade across a whetstone every 3-4 months or so to maintain the razor edge and sharpness. This process is known as honing the blade. Honing is different from stropping. In stropping, the process does not remove much metal from the blade. All it does is straighten the sharp edge of the blade. In the case of honing, some metal is removed from the blade edge as you make it thinner are sharper. ​​Excellent wooden scale and box. ​A thicker blade will last longer and survive more honing. ​No strops or accessories are provided. ​​The larger blade can impede the view while shaving. This is a very elegant looking steel razor with a mahogany handle. It comes with an exquisitely carved wooden box (again mahogany) that makes it an ideal gifting option. As mentioned in the product title, this is a wider 7/8 blade, which makes it much thicker than your average straight razor which usually sports a 5/8 or 6/8 blade. The blade is made from high-quality carbon steel sourced from Japan, and a has a soft rounded finish. The A.P. Donovan products are manufactured in the US as well as Germany, EU, and Asia. The overall construction is very sturdy. The mahogany handle has a rich finish with the fine grains standing out pretty well. The manufacturers assert that the premium wood is sourced from the forests of Madagascar. Both the handle and the blade sport premium etchings and inlays of the brand. Etchings on the tang indicate that this is a handcrafted product. The package includes just the razor and the box with no additional accessories. This may not be the best razor for beginners due to the thickness of the blade and the bulk. ​Beginner friendly, does not require stropping or honing. Gives a safer shaving experience. 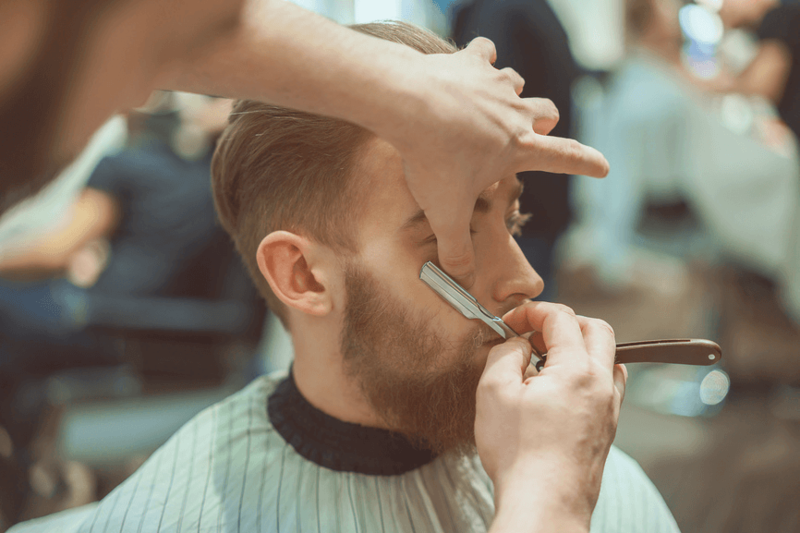 ​Not the authentic straight razor experience. ​​​You need to buy blades frequently. With modern health code regulations, it is no longer considered acceptable for barbershops to use the same blade on multiple customers. This rules out regular straight razors as the blade on these cannot be removed and disposed. As a result, a new design which incorporates disposable half blades into the traditional straight edge razor chassis was created. The Parker SR 1 is ideal for those who want a straight razor shaving experience without the constant honing and stropping. Though this is primarily a professional barber's tool, it can also be used easily at home. You can use disposable blades with this razor. It accepts both single edge blades as well as half of those double edges blades. You get 5 Shark Super Stainless blades free with the package. One blade should last for at least 3-4 shaves. The razor sports an all-metal construction, completely crafted out of stainless steel. The blade holder has a secure mechanism to ensure that the blade is safely aligned. The blade is adorned with high-quality engravings. ​Comes with a useful blue-metal storage tin. ​​Very slim and lightweight razor that is easy to wield. Dovo is one of the top-name brands in the business of manufacturing high-quality straight razors in the modern era. This is a high quality razor made in Germany, and sports the "Solingen" tag on the tang. Solingen is the city in Germany famously known as the "City Of Blades." The blade on this razor has a rounded point and is made from carbon steel and sports a "Prima Silver Steel" etching in Gold. In striking contrast to the blade, the handle is made out of dark ebony wood. The word "Ebenholz", (German for Ebony), is engraved in gold inlay on the handle. The blade is a 5/8, which makes the razor very light and easy to hold. With the rounded point and lightweight design, this could be a great razor for beginners. The quality of workmanship is quite high. ​​​Blades use high quality Japanese steel. Short blades offer improved control while shaping. ​​Replaceable blades do not require any stropping or honing. ​Does not come with extra blades. ​The unique shape and design may take some time to get used to. The Japanese have a unique straight razor design that is easy to spot out of the crowd. 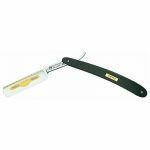 Feather is one of the big name brands in modern straight razor markets. And this razor has all the hallmarks of a quintessentially Japanese razor, with its unique short blade. This is a non-folding straight razor with replaceable blades. This a great option for beginners looking to foray into the world of straight razors. Since the entire blade is replaceable, you don't have to worry too much about stropping or honing. The replacement blades from Feather and other lesser brands are quite affordable as well. They use a specially engineered handle with a unique shape. The material used is high quality silicone resin. The handle has a spring mounted mechanism to hold the blade. It is easy to remove and replace the blades on this one. 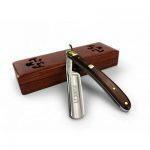 The handle provides excellent grip, and the small blades provide excellent control while shaving. ​​​​One of the best blades in the list. ​​​Affordable, for a high quality German blade. Requires some stropping before use. ​Cheap handle when compared to other brands. Boker is another big-name German company in the business of making knives and blades. They are based in the famous town of Solingen. This is a well crafted straight razor from the German makers. It sports a stainless steel alloy blade with a soft rounded point. The blade has some really exquisite etchings on the sides as well as on its tang. The alloy contains silver with the aim of improved sharpness and cutting prowess. The 140521 King Cutter is an affordable offering from Boker. As a result, it sports a synthetic handle/scales. This black handle is wear resistant and quite durable. And the overall build is also quite slim, thanks to the 5/8 blade, making this a great option for novices. ​If we had to pick a winner out of the list of the best straight razors, it would have to be the Dovo Straight Razor Carbon – Ebony Wood Handle. 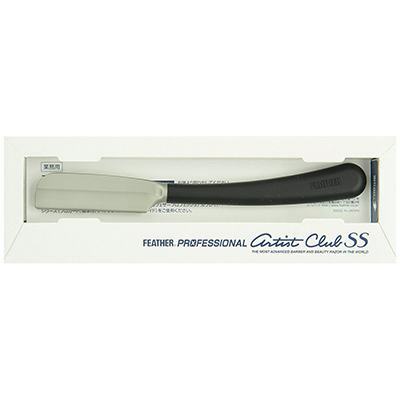 This is a great straight razor for both beginners as well as experienced users. It has the best quality steel, as well as scales made from the best wood for the purpose. The slim 5/8" blade and rounded point make it an easy to use razor overall. And it also provides a completely authentic straight razor experience, as you have to learn stropping and honing to get the best out of it. Just remember that using a straight razor is quite different from using ordinary safety or DE razors. Read some guidelines online, watch some video tutorials and take things slow. With patience, you should master the art within a couple of months. All the best!